The injury bug does some mysterious things sometimes. After forcing featherweight king Jose Aldo to postpone his UFC 149 tango against Erik Koch with an injury, it is now Koch’s turn to bow out with an undisclosed wound. Unfortunately for “New Breed,” the Octagon show rolls on without him. Former lightweight champion Frankie Edgar (Pictured) has agreed to serve as substitute to challenge Aldo for his crown at UFC 153. “Obviously, we’ve had a rough couple of weeks here at the UFC, and then sure enough, I walk in to work today, and Erik Koch is hurt,” UFC president Dana White told USAToday. 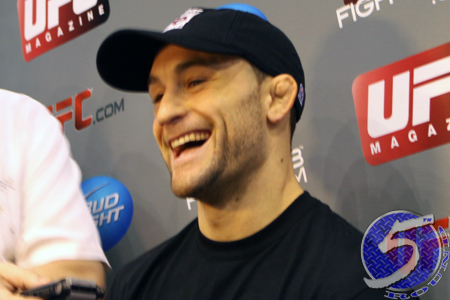 “But Frankie Edgar, being the stud and the warrior that he is, steps up and accepts this fight. After losing his lightweight belt to Benson Henderson at UFC 144 and failing to recapture the strap in their rematch earlier this month, White made it clear Edgar wouldn’t get another crack at the 155-pound hardware for quite some time. That’s when “The Answer” begrudgingly decided to shed 10 pounds and transition to featherweight. Edgar is the only athlete in UFC history to compete in six consecutive title fights, with half of them being of the rematch variety. This scrap marks his seventh consecutive championship affair. “Scarface” will be riding a 14-fight winning streak into the shootout. Aldo was last seen posterizing Chad Mendes at UFC 142. The 25-year-old assassin is arguably the baddest 145-pounder to ever storm the MMA scene. HSBC Arena in Rio de Janeiro, Brazil hosts the October 13th fiesta.